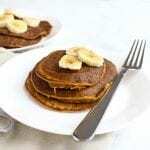 Pumpkin Blender Pancakes for One are a filling and nutritious breakfast option that is fun enough for the weekend but easy enough for a week day! Dairy free, gluten free and low FODMAP. 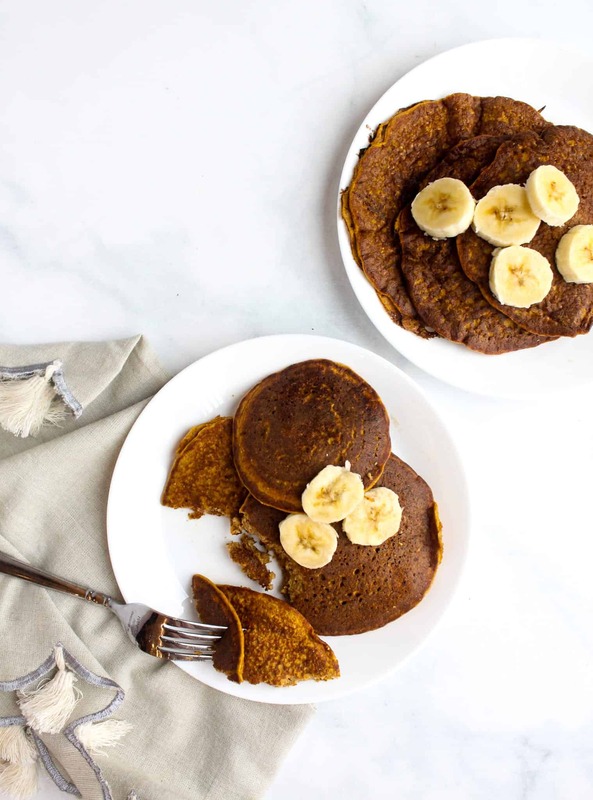 Pin Pumpkin Blender Pancakes for One Here! For the past few months, Brian and I hav been living with his parents. We sold our first home back in November while we were visiting Thailand, and have been working with contractors to renovate another home that is pretty much in the same location as our first house. The timing of the two houses being ready to go at the same time, did not line up…which is why we are living with Brian’s parents! 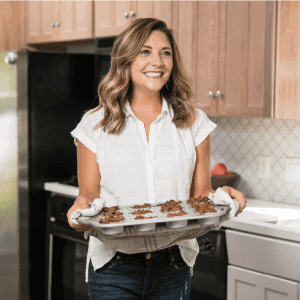 The reason I am even bringing this up is because I have VERY limited pantry and refrigerator space, which means I am constantly thinking about how I can use food that has been in the freezer/pantry for a while and how can I stretch a few ingredients to go as far as possible. It also means I don’t have a ton of storage for leftovers, so single serving and small batch recipes are a must! Pumpkin Blender Pancakes for One came to life because honestly I had quite a bit of pumpkin leftover from November and the holiday season! I’ve made Pumpkin Blender Pancakes for myself, for Brian, for both myself and Brian SEVERAL times and they are always a hit. 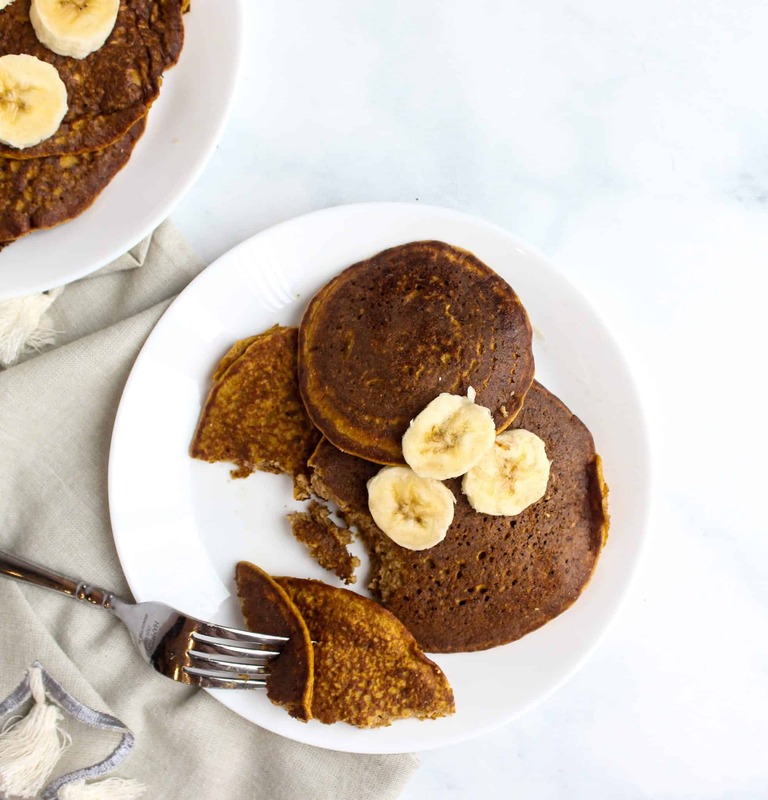 They require minimal time to prepare, which is really nice because I feel like with this recipe pancakes no longer have to be reserved for the weekend only! 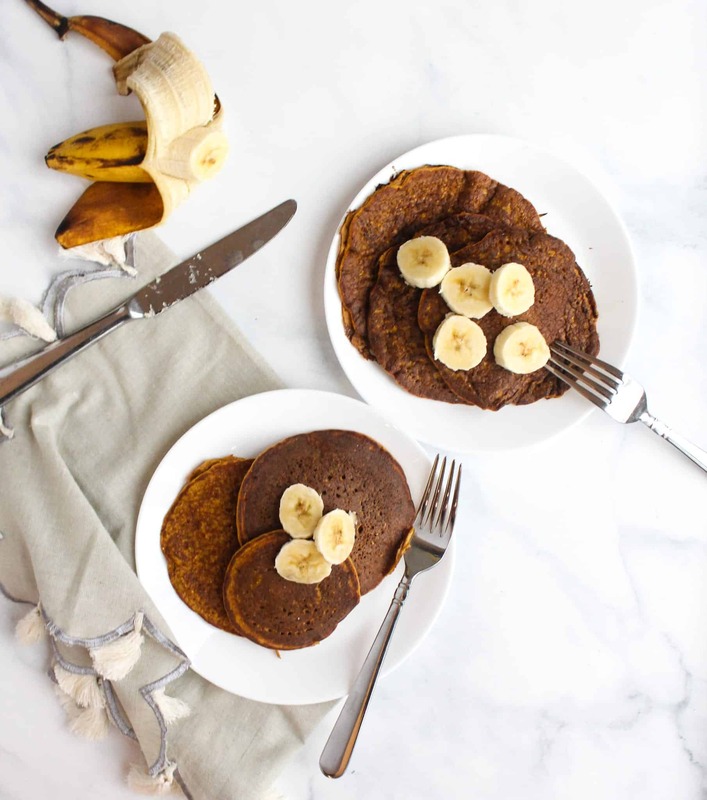 These pancakes are made with oat flour. To make oat flour, I simply blend the necessary amount of oats in a blender or mini food processor. It’s that easy! For this recipe, I then add the remaining dry ingredients and blend/pulse the ingredients together before adding the wet ingredients (your favorite milk, pumpkin, egg, maple syrup, apple cider vinegar, and vanilla extract). If you use certified gluten free oats, this recipe is gluten free! I prefer to use Ripple Milk because of the protein content and neutral flavor, but I think many milk options (almond, dairy, coconut) will work here. If you give this recipe a try, let me know what milk you use! 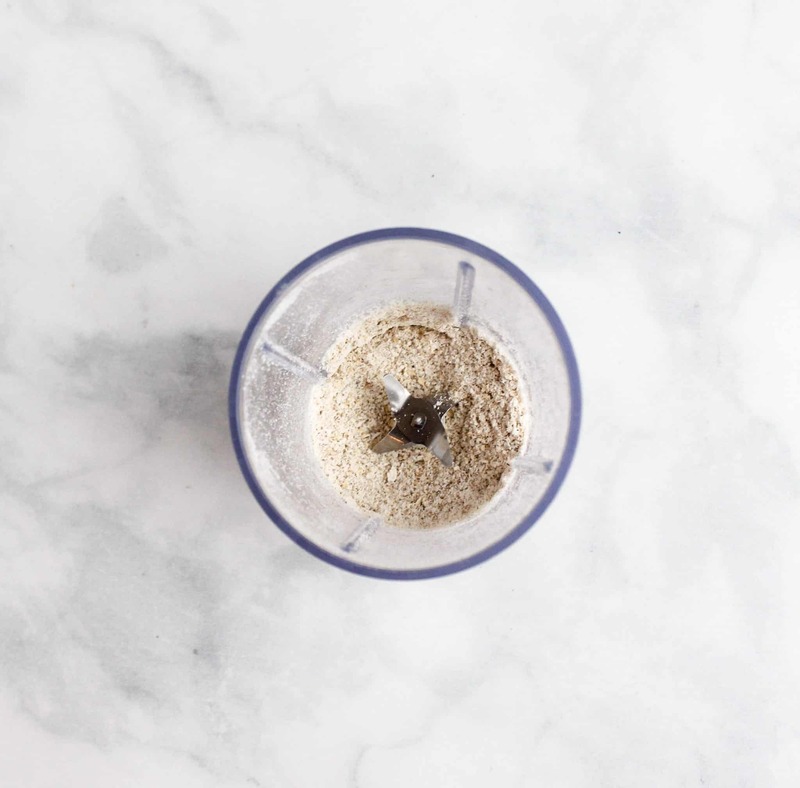 In a small blender or food processor blend the oats until they are ground into a flour-like texture. * Then, add the baking powder, spices and salt. Next, add the milk, pumpkin, egg, maple syrup, vanilla and apple cider vinegar to the dry mixture in the blender or food processor and pulse until combined. The skillet will be hot enough when you sprinkle a little water over it and it sizzles. Spritz the pan with your favorite non-stick cooking spray. Pour about 1/3 of the batter on the hot skillet and allow to cook for about 2 minutes or until the top is bubbly and starts to dry out. Flip and cook the second side for about 1 minute. Repeat until all the batter is gone. Will make 2-3 pancakes. These look great! I am totally about pumpkin in pancakes year round, too! I love seeing the progress on your new place via instagram stories but can only imagine how tough it would be to be without your own space that long. What a great sounding recipe and perfect for anyone that just needs to make a single serving of pancakes.